Select the required item from the list and click Edit Model. 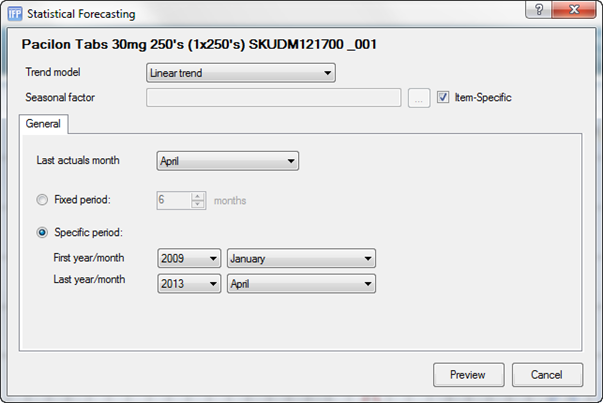 Select the Trend Model, Seasonal Factors and Period Options to apply to the Item and click Preview. Evaluate the fit of the selected model to the data on the graph produced from your selected options. If you wish to change the model, click Edit Model and return to step 2. If you are happy with the model, click Apply Model. This will update forecast values in the data grid for the item. If necessary, you may edit the forecast data using the Graphical Adjustment toolbar. If you wish to edit individual months you may edit them directly in the data grid. When you are happy with the results, click Save Data. This will save the final forecast values in the selected target forecast files. This applies the current saved model for each item to the latest available actual demand data. This approach allows for fast updating of statistical forecasts for a large number of items via a single operation. It also avoids the need to review models and associated graphical analyses for each separate item. Updated forecasts may then be saved for all items by using Save All Models. Once a model has been saved for an item, the details of that model are automatically used as the default for calculation of forecasts in future months. The last year/month is automatically updated to the latest available month of actual data in the default model. Set the Trend Model to No Model and click Preview. Click the dropdown arrow next to Apply Model, then click Save Model.